Happy weekend, guys! We are painting this weekend with little breaks for wall paper stripping in another room, but since we’ve only just started we are in high spirits, very motivated and enjoying the ride so far. Once the wallpaper in the study comes off, I’ve decided to learn to plaster the walls myself. It’s like frosting a giant cake, right? What can go wrong 😛 ?! It cannot be that hard, plus I think I will really enjoy the process. Wish me luck! I’ve been thinking that plastering may be something within my skill set for a while, but what finally motivated me was a rather unpleasant experience. We had a plasterer round our house the other night to get a quote and he was being both racist and sexist to my face. I was so stunned, I had no idea how to react. I laughed it off to diffuse the tension and then I’ve had some time to think about it some more and I got so mad! I should have thanked him on the spot and told him to leave. What an idiot! Needless to say he isn’t getting the job. I am not putting up with this cr*p in my own house!! Like most women, I’ve had a lifetime of sexism directed at me and I’ve had enough, quite frankly. Racist remarks were even more of a shock, but then that’s the new normal in this Brexit climate, isn’t it? It makes me both sad and mad at the same time. I’ve lived here for over 12 years now and for the first time ever I feel like I do not belong anymore. And I know that so many other people feel exactly the same. Fortunately, there are still some open-minded and welcoming British people around, who treasure diversity, or else I would be off at the drop of a hat. 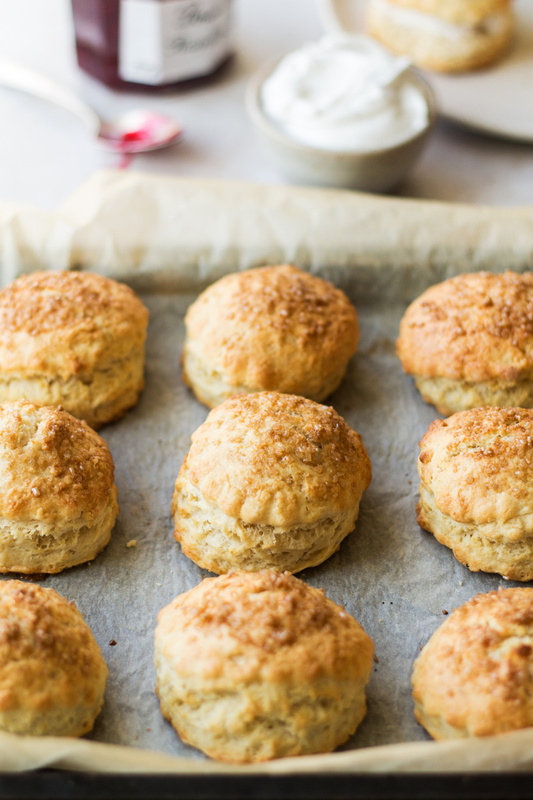 So while I will probably be up a ladder with a steamer in one hand and a scraper in the other as you read this, I will take a few minutes to share this new recipe for vegan scones with you to sweeten up your weekend. I’ll be the first one to admit that I was a massive scone sceptic for years. I kept on telling Duncan that I hate scones and I do not understand what the fuss is all about. It wasn’t until I learned to make them myself that I’ve become a convert and also realised that the scones I did try must have been stale and overworked. If you take the time to make them properly and eat them while fresh, they are really delicious. The key to a nice, well-risen scone is handling the dough as little as you can get away with. It may affect the way they look, as the dough will be a bit bumpy and scraggly, but they will taste so much nicer, I promise. So please resist the temptation to knead the dough smooth – this is not bread. Handled correctly, they will end up light and fluffy with a nicely browned, crispy crust. Once the scones are out of the oven, wait for them to cool down a bit and then cut them in half with a serrated knife. Fill with a thick layer of vegan yoghurt and your favourite jam. While strawberry jam appears to be more traditional, I prefer raspberry jam myself so that’s what I used. Also, if you don’t live in the UK, you might not be aware that the way you fill your scones is a bit of a contentious point between two gorgeous areas of the UK, Devon and Cornwall. 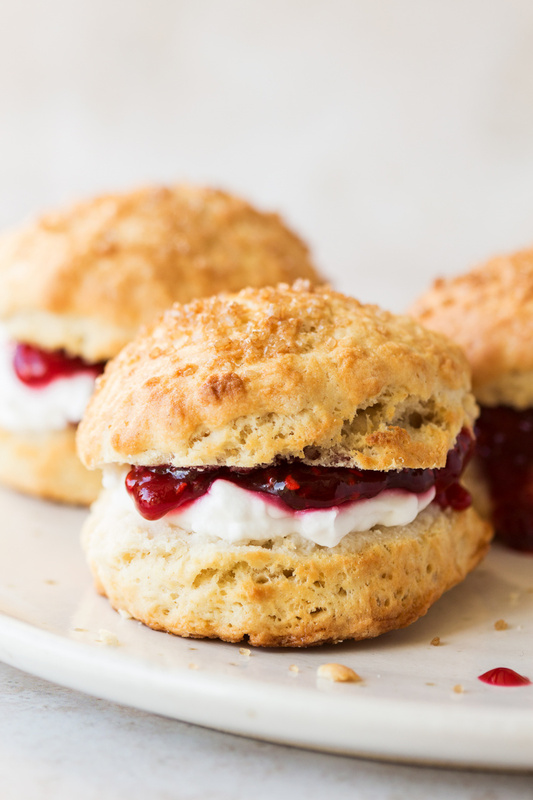 While Devon scones feature clotted cream at the bottom and jam on top, Cornwall insists that the reverse order is the only correct way to serve them. I am with Devon on this one, but try both ways and decide for yourself 😛 . PS: If you make my vegan scones, don’t forget to tag me on Instagram as @lazycatkitchen and use the #lazycatkitchen hashtag. I love seeing your takes on my recipes! Sift flour and baking powder into a large bowl. This is not strictly speaking necessary, but it helps to get lighter scones. Add sugar and salt and mix well. Chop coconut oil small and then rub into the flour with your fingers until the flour looks pebbly. Do not rush this step or take shortcuts if you are after light, nicely risen scones. Start adding plant milk slowly while bringing the dough together. Start off using a spoon and then just use your hands. Do not handle the dough too much, just until it’s combined and stays together. Do not worry about it being very smooth. Place the dough in the fridge for 15-20 minutes (no longer than that as the baking powder will lose its fizz) while you heat up the oven to 220° C / 425° F and line a baking tray with a piece of baking paper. After the dough has had a chance to rest, roll it out on a lightly floured surface. 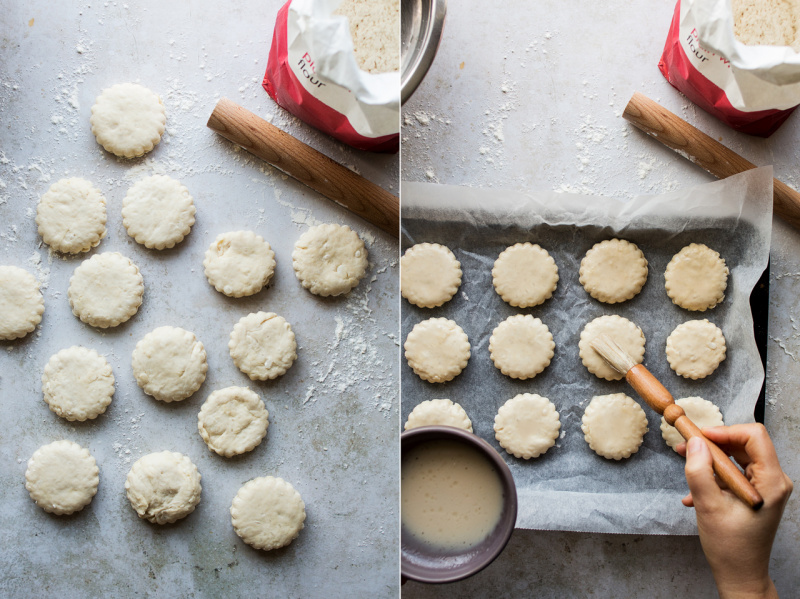 Keep the dough thick (2 cm / 0.75″) for fluffy scones. 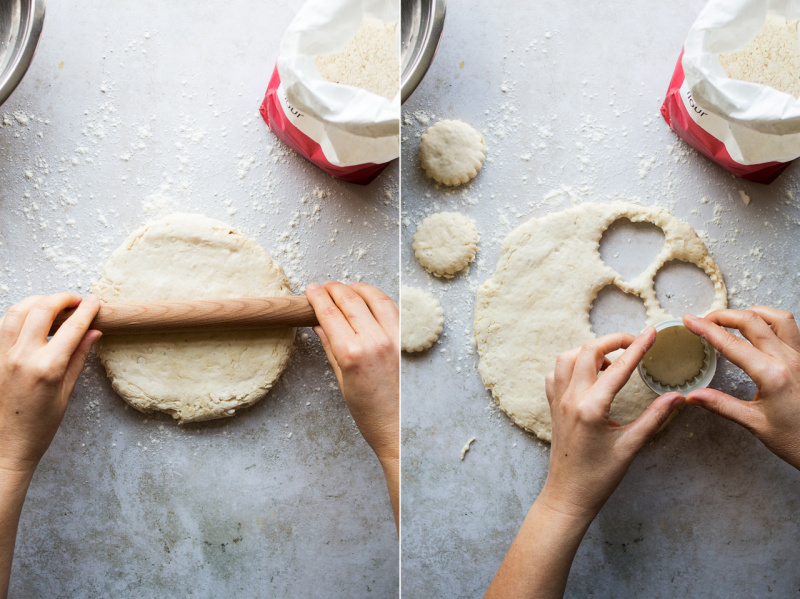 Use a fluted cookie cutter that is 5 cm / 2″ in diameter and cut circles out of the dough. Do not twist the cutter as that inhibits rising, simply apply a lot of pressure to the cutter and then lift the cutter with a scone inside. Place over the baking tray and gently pop the scone out onto the tray. I found that dipping the cutter in flour and then shaking the excess off helps a lot when it comes to releasing the scones onto the tray. Bring any dough leftovers very gently into a ball and cut out some more – they won’t be as good as the first batch, but if you handle the dough super gently, they will still be very tasty. Place the scones on the prepared baking tray, making sure there is some space around each one. Mix all the glaze ingredients together in a small bowl and glaze the tops of the scones with a pastry brush. 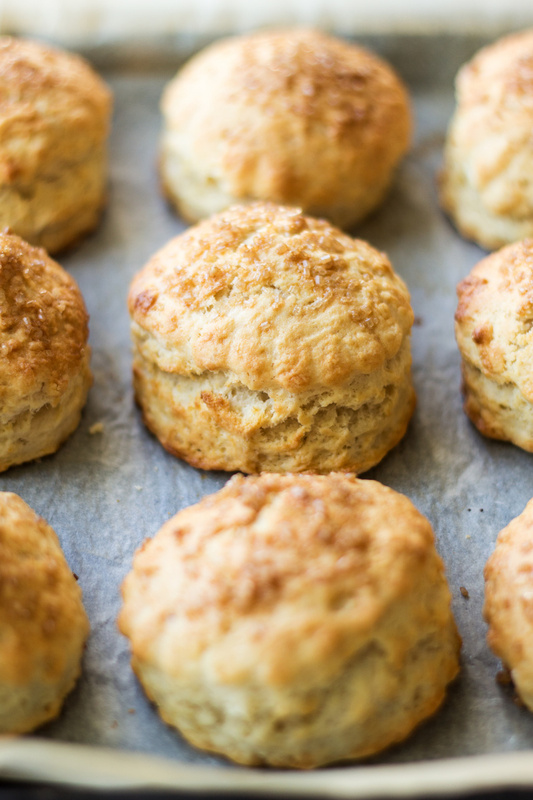 Sprinkle each scone with some demerara sugar (if using) and bake for 12-15 minutes. My oven heats the right hand side more than the left so after 12 minutes the ones on the right were done, but the other ones needed another 3 minutes. I rotated the tray before baking them for the last 3 minutes so that they are evenly browned on all sides. 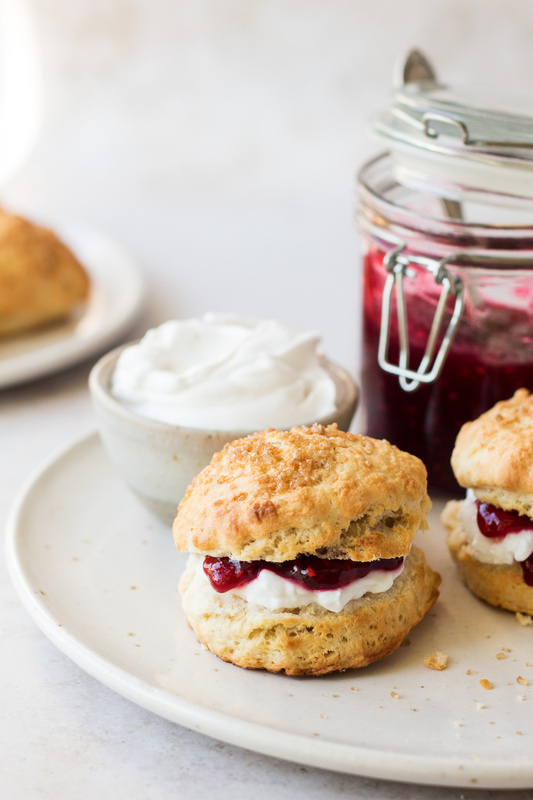 Let the scones cool down a little before cutting them in half with a serrated knife and filling them with coconut yoghurt and jam.